We have some beautiful captive bred baby Indian star tortoise for sale. These little star tortoise for sale are eating a variety of greens and are very active and healthy. We also have some gorgeous well started baby Indian star tortoise for sale, which we recommend over the more fragile Indian star tortoise hatchling for sale. 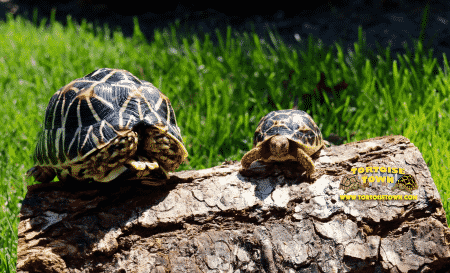 If you’re considering an Indian star tortoise, also consider our yearling Indian star tortoises which are extremely well started yet still small (under 3.25″). They have extremely bright colors over a very solid black contrast and are sure to impress anyone looking for an exotic tortoise for sale. Indian Star tortoises are the smallest of the star tortoises, and therefore make great tortoises for those seeking an indoor or outdoor tortoise, that remains small. 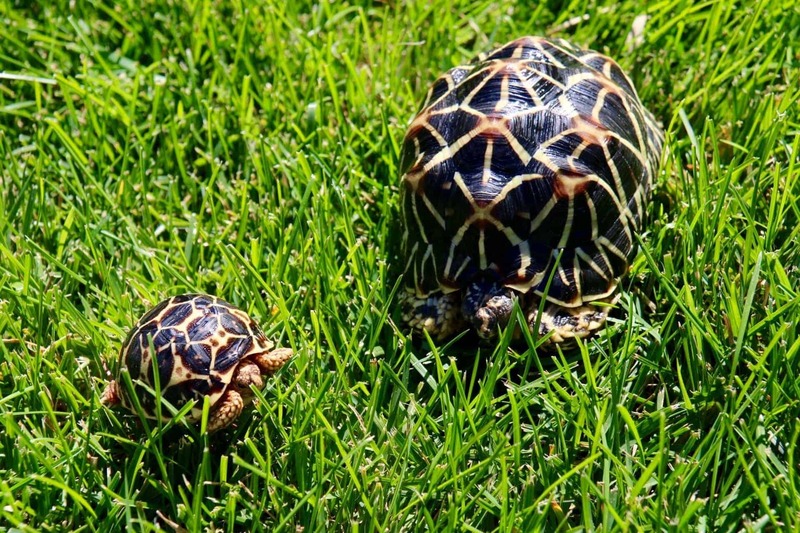 At full maturity, Indian star tortoises reach sizes of 6-8″ on average, with a small percentage reaching 9-10″. When purchasing an Indian Star tortoise hatchling, it is imperative that you buy your baby tortoise from an experienced tortoise breeder and keeper. We are pleased to say that our baby stars are FANTASTIC! With a biologist ON SITE, we pride ourselves on selling only top-notch tortoises, ready to ship to you via FedEx or UPS overnight. One shipping charge covers up to 4 Indian star tortoises. Indian Star tortoises for sale are one of the more popular, small tortoises for sale. Of all the small tortoise species available to purchase, some would say that the Indian Star is the most attractive. Indian Star tortoises are fairly easy to care for, so long as you invest the time to educate yourself about proper Indian Star tortoise care. We highly recommend you check out our extensive and FREE Indian star tortoise care sheets, available throughout our website. Baby Indian Star tortoises are available for sale online, from time to time are medium-high prices. Because an Indian Star tortoise for sale is a small species of tortoise, they only lay a couple of eggs, which drives their price up over larger species of tortoise, and giant tortoises for sale. Baby Indian star tortoises are as cute as can be, but they need proper care to thrive. When setting up for a baby Indian Star tortoise the most important thing is humidity. Our biologist advises that high humidity and low air flow are the key to success. With limited air flow, and high humidity, baby Indian Star tortoises will absolutely thrive. It was a common misconception years ago, that most species of Star tortoise, including the Indian, needed very dry air. 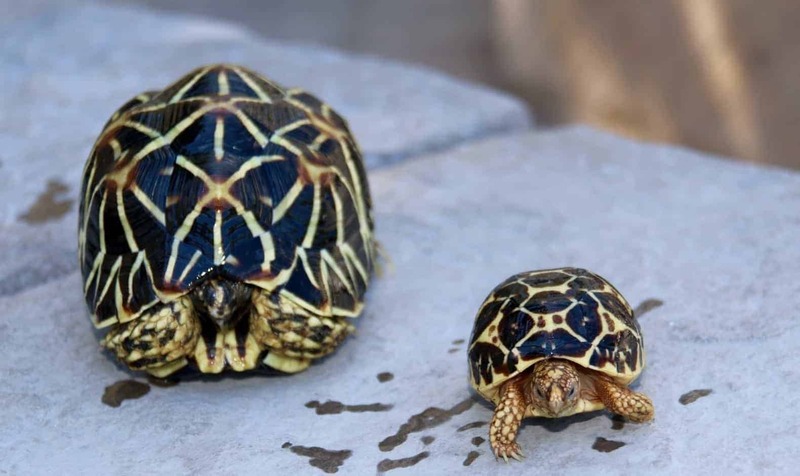 While that may be the case in well established larger adults, we have found that Indian star tortoise babies need it to be humid. Low movement, high humidity air with humidity around 75% is how we keep our baby Indian Star tortoise groups. It allows them to grow evenly, with very smooth shells. Humid air with low movement and warm ambient temperature really does seem to allow them to grow so very quickly. At the same time, their shells remain and grow smooth like a bowling ball. Variety is the spice of life they say, and it certainly is the most important part of what to feed your baby Indian star tortoise. Feeding your new Indian star tortoise hatchling a wide variety of high-quality fresh greens and veggies is key to success. Indians really do love a variety of food, and we here at tortoise town always feed a wide variety of fresh greens. Tortoise town prepares our baby tortoise food daily by chopping a wide variety of greens. Greens we feed our baby tortoise include kale, romaine, collard greens, mustard greens, radicchio, various lettuces, dandelion. We also chop up some yellow squash and chop up some carrots in our blender and spread them across our tortoise salad as we call it. Soaking mazuri tortoise chow in water until soft, and tossing it with the greens is HIGHLY recommended. Using Mazuri to feed your little star tortoise also will supplement the lack of real UVB during the indoor months. When shopping for a new baby tortoise for sale, be sure to choose Tortoise Town! Bought a pair of Indian stars about a month ago and just wanted to give tortoise town some great feedback. My tortoises are very active and are really pretty. Their colors are bright as I had hoped and they definitely are healthy big eaters. Very happy with my purchase and would high to recommend tortoise town! Just picked up a pair of 6 month old Indian star tortoises. I’ve been shopping with tortoise town for a while and always have had great experiences, fast shipping and very knowledgeable friendly service. As far as quality of tortoises, these stars are as good as it gets. Stunning and heavy and healthy. If there were a higher rating I’d give it! If your deciding on where to buy an Indian star torotise for sale online, tortoise town is the spot! Was searching for quite some time for a pair of Indian star tortoise for sale. Finally found Tortoise Town! Love my Indian star hatchlings I purchased from Tortoise town this past summer. Fast shipping and great animals!